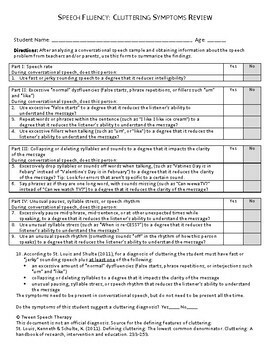 This form should be completed after analyzing a conversational speech sample (5 minutes minimum) and obtaining information about the speech problem from teachers and/or parents. 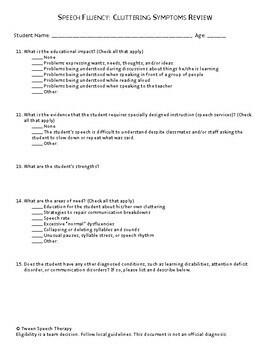 This form is a “review” of the data, so you will want to have notes written down somewhere about what you heard in the conversation sample and what the parents and teachers reported. 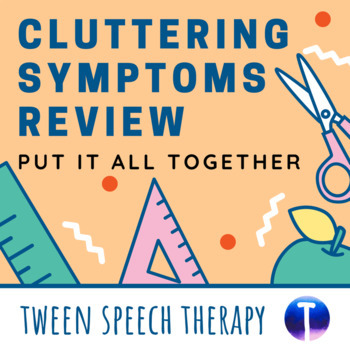 While not required, you may find it helpful to purchase the Cluttering Rating Scales (parent/teacher reporting forms) and the Cluttering Conversation Sample Analysis. Note: all of these forms are included in the Cluttering Bundle. You can definitely compile your own notes from your parent/teacher interviews and conversation sample analysis, instead of using the products I mentioned above, and still use this form to review all of the data! If you want to take notes on your own without buying the other forms, but aren’t sure how, you can always download a free “preview” of the other forms and use the preview to help you with what to write down in your notes.